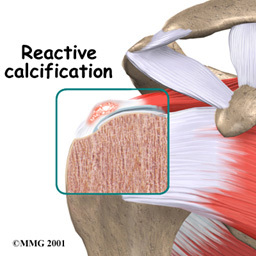 Calcific tendonitis is a painful shoulder condition where there is a build-up of calcium in the rotator cuff (calcific deposit). When calcium builds up in the tendon, it can cause a chemical irritation and increase in pressure which leads to pain. The pain can be extremely intense and is one of the worst pains in the shoulder (the other being Frozen Shoulder). 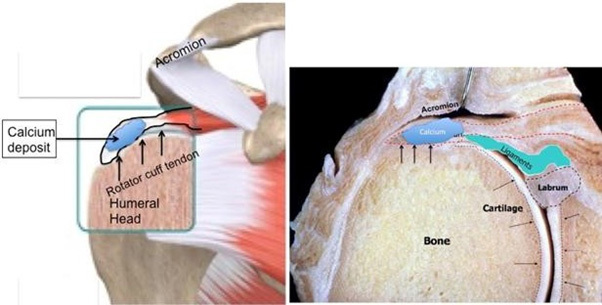 The calcific (calcium) deposit reduces the space between the rotator cuff and the acromion, as well as affecting the normal function of the rotator cuff. This may lead to subacromial impingement (rubbing) between the acromion and the calcium deposit in the rotator cuff when lifting the arm overhead. The cause of the calcium build-up is unknown. Commonly found in people between the ages of 30-60 years. It does eventually disappear spontaneously, but this can take between 5 to 10 years to resolve. 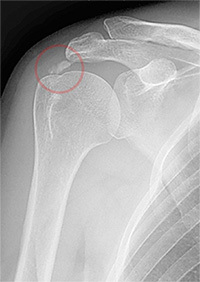 The calcific deposit can be seen on plain x-rays; however ultrasound scan is better to find small calcific deposits which can be missed on x-rays. Ultrasound also makes it possible to assess the size of the deposit in all directions. The clinician can also see the blood vessels around the calcific deposit. Ultrasound guided Barbotage: Under ultrasound guidance the calcific deposit is injected with a salt water solution and the calcium is also sucked out into a syringe. The area is then repeatedly washed. Surgery is required if the pain is not controlled with the methods above and/or the pain is extremely severe, with night pain. 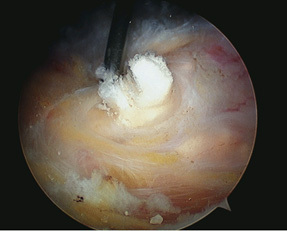 The goal of any surgery to reduce the effects of impingement. This is done arthroscopically (“key-hole surgery”) and increases the amount of space between the acromion and the rotator cuff tendons, which will then allow for easier movement and less pain and inflammation. The calcium deposit is also debrided and released at the same time. Q: What causes calcifying tendinitis? Q: How common is this condition? Q: What symptoms do I get with this condition? A: The pain can be constant and nagging and is felt in the shoulder and sometimes down the arm/hand. It is made worse by elevating the arm. Some patients also have excruciating attacks of pain, which then abate to a lower level after a few days. The calcium can spontaneously absorb and this process is associated with severe pain. Q: What does a cortisone injection do? A: It helps with the pain for a short term basis but it does not take away the underlying problem – the calcium deposit. Q: How many injections can I have? 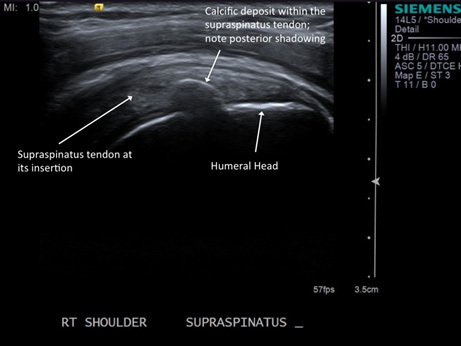 Q: What treatment options are available for calcifying tendinitis? A: The physiotherapist can help you to maintain the range of movements in your shoulder. Some patients also find therapeutic ultrasound to be of benefit. However, the evidence that it works is conflicting. The Cochrane Musculoskeletal Database Review of 26 trials found that both ultrasound and pulsed electromagnetic field therapy resulted in significant improvement in pain compared to placebo. However, a further meta-analysis of 35 randomised controlled trials found that only 2 studies supported the use of therapeutic ultrasound over placebo. The remaining 8 showed that therapeutic ultrasound is no more effective than placebo. Q: What is extracorporeal shockwave therapy? Q: Would you recommend extracorporeal shockwave therapy? Q: What does the operation entail? Q: How long does it take to recover from surgery? Q: Are there any serious complications with surgery? A: The most common complication is stiffness (approx 10%), sometimes referred to as Frozen shoulder. This is more common in patients with diabetes. If it does occur, it does not mean that further surgery is necessary. It just means the recovery may take a little longer.